If that fella from Grand Designs was to visit, he might, over a spam sandwich in the cafe outside the Oastler Centre, appraise the place as being a bit heavy on ‘dystopian chic’. Mary Portas, sipping an early morning cider and black at the Queens next to the Interchange, might lament our preference for Ladbrokes over Louis Vuitton. Poundland over Paul Smith. They might, if they’re lucky, get a wave from Bradford Jesus Man; a novelty that, like the enigma himself, never gets old. Yes it might need a lick of paint, which it’s getting, but there’s a ton of good stuff going on. We’ve even got a Nando’s. Anyway, Kev, Mary, we’re not here to talk about architecture and shopping, that’s a debate to be had another day, but do come back soon and see how things are progressing. It’s looking up. We’re here for the food, so let’s go for a curry. We’re famous for ‘em. No, Mary, you can’t have a korma. “Where’s the best curry?” is a question often aimed at Bradfordians, along with “is Billy Pearce doing panto again?”. The answer to the latter is simple: “obviously”. Answering the former is a bit trickier, but to make life a little easier for the plethora of Bradford day-trippers, we’re endeavouring to get around a few of the city’s curry houses, eat some stuff and give our verdict here. Akbar’s, about a £3 taxi ride out of the centre, gets mixed reviews from local curry-fanciers, a trend we’re expecting wherever we visit. Some give it a steady 6/10, others put it up there with ‘the best’. Curry’s a serious business here and opinions are regularly divided. “The Best” is unlikely to be a unanimous call. It’s a Wednesday teatime and it’s packed. In the hour or so we’re there there’s a constant stream of punters. If you go on a weekend, book. It looks like it used to think it was a bit posh, but it’s fraying around the edges now. That said, it’s more contemporary than some of the more traditional/older places we’ll visit. You don’t go for a Bradford curry to be wowed by the look of a place, though. It defeats the object. 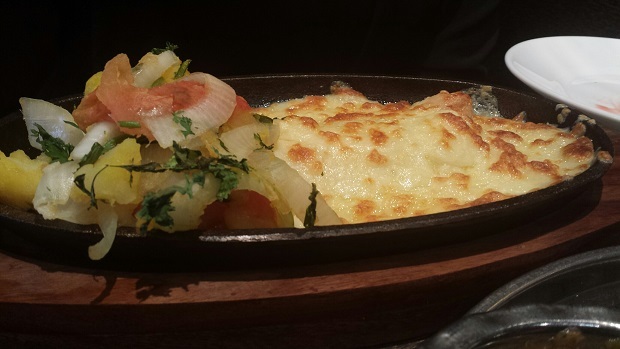 We’re not sure that our starter, a chicken nambali, is a staple of South Asian cuisine with its melted cheese over soft chicken. It is tasty, but probably not what you’ve come up in a taxi for. Main courses are more like it. 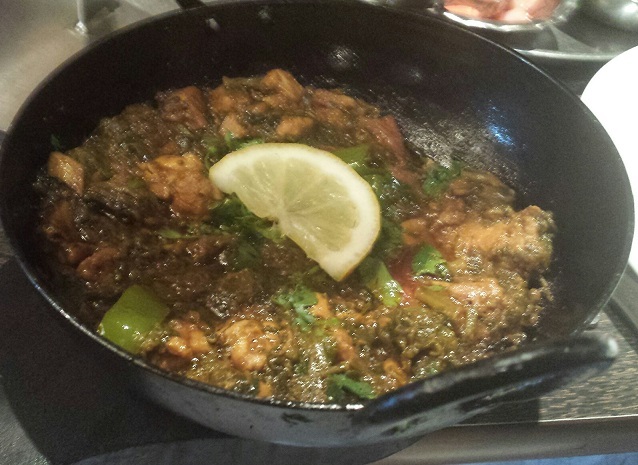 A chicken and spinach karahi is neither swimming in sauce or bone dry. The spinach and coriander flecking the sauce add freshness and there’s a spiky kick.Top drawer. 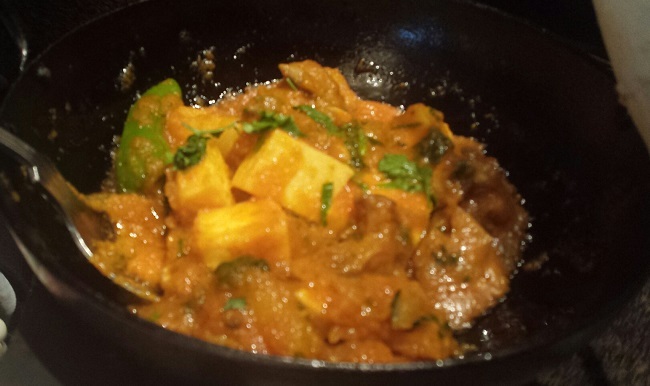 Mushroom aloo paneer balti is lighter but still packs a punch. The cheese (texture of feta, ish,) has a yoghurty acidic flavour and the potatoes are of ‘meat and potato pie’ appearance: steaming, firm but ready to yield to a fork, and with the added bonus of being zestily hot. 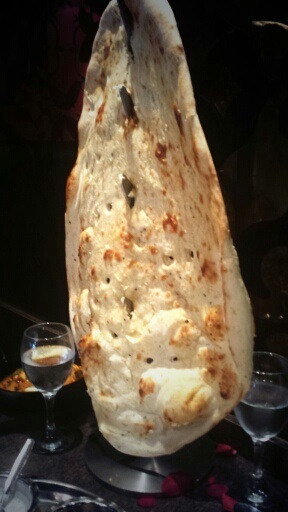 Stupidly, we ordered the family naan because everyone else was and we didn’t want to look tight. It was thick and buttery, airy and blistered, but far too big for what we needed. 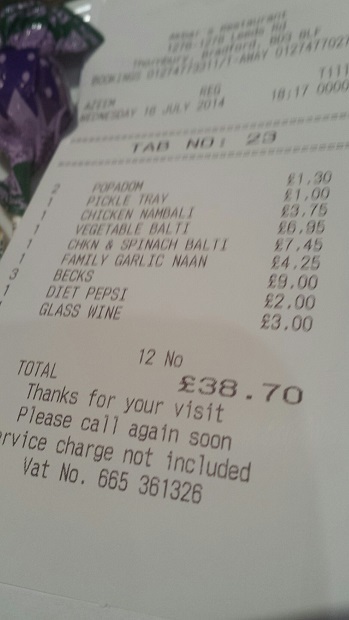 The food was 24 quid (we’d also got poppadums and pickles, obviously,) and with drinks on top it came to £40. Atmosphere was good, if you like it ‘bustling’, and food was far better, in our book, than ‘steady’.